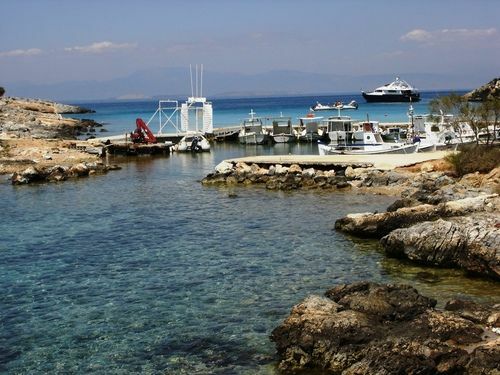 Aponissos is one of the best spots in Agistri. 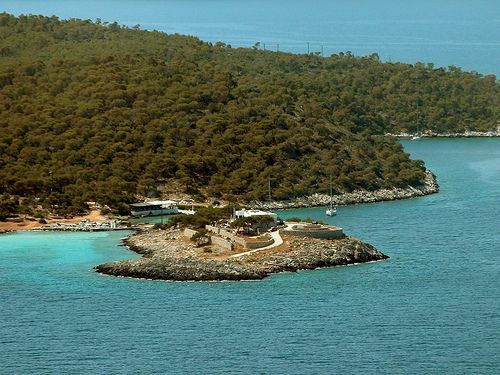 It is a small peninsula, found on the western coast of the island, resembling to an islet which is actually connected with the main land. 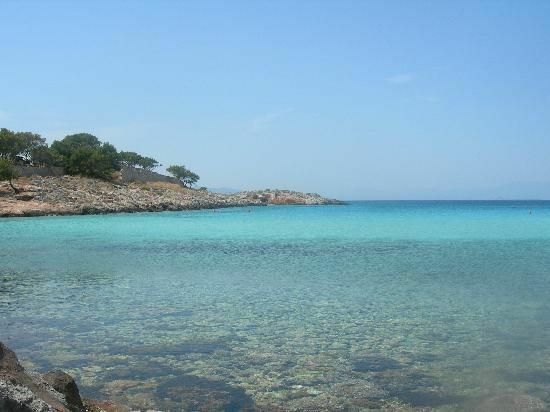 The area has a small beach with marvelous transparent turqouise waters and is surrounded by a lush pine forest. 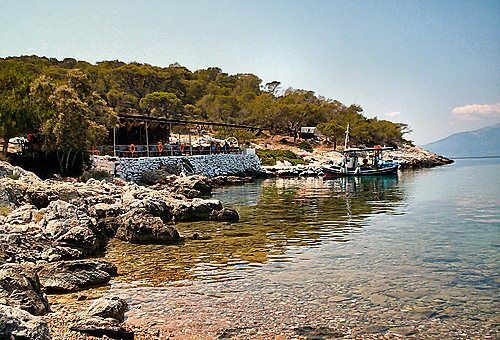 Aponissos has a simple traditional taverna which is popular among swimmers and among yachters, who anchor there or at the near by Dorousa anchorage.The taverna is open during the spring and the summer and offers delightful views of the sea and Dorousa islet. 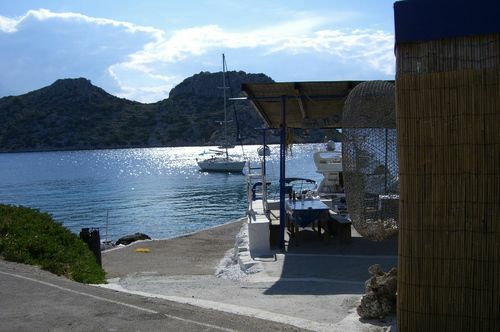 It serves simple food and sometimes fresh fish. To reach it by car, you should follow the road through Limenaria village, passing by a salty lake and then through a a rocky path. 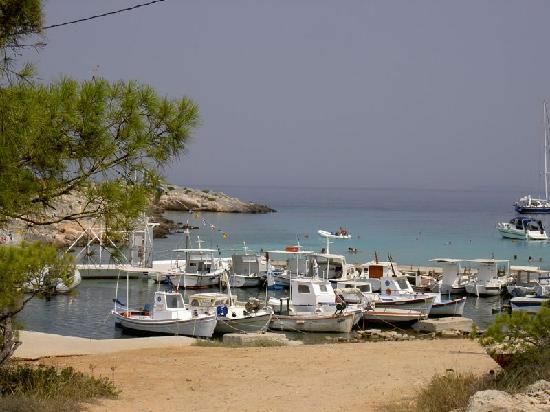 There is also a bus which connects Skala with Limenaria and stops close to Aponissos. 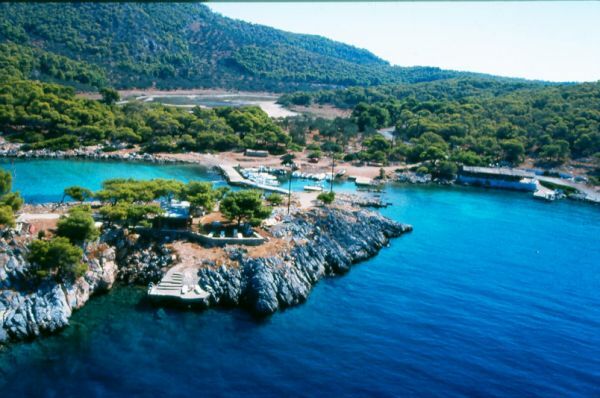 Agistri has also a taxi which may get you there. 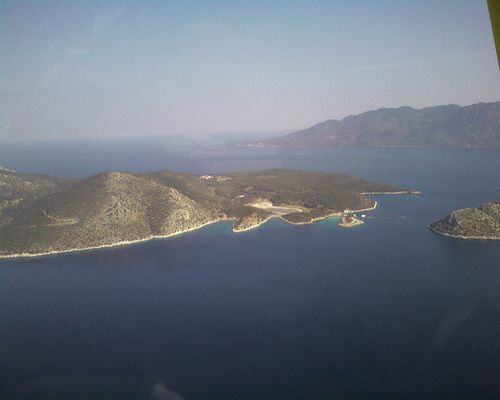 Sea taxis also travel around the island and from Aegina to Aponissos at a reasonable price. 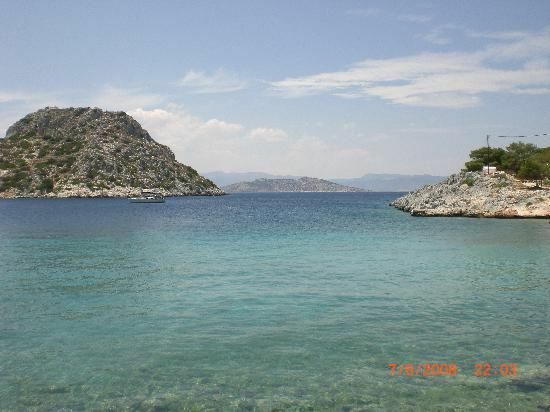 Archaeological research has indicated that Aponissos was inhabited in ancient times. 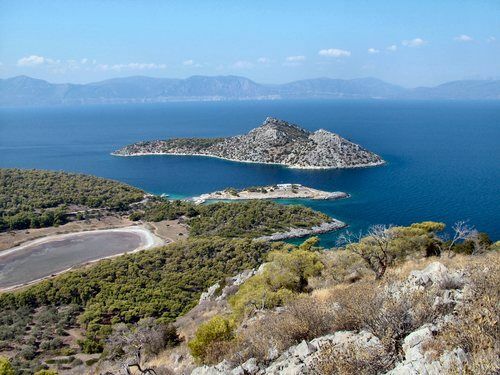 On the western coast of Agistri, quite close to Aponissos, there are sunken antiquities found below the surface of the sea. 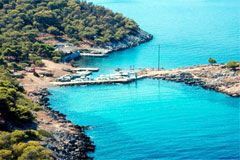 ANCHORAGE & MOORING INFO: Aponissos offers a tiny harbour, suitable for very small boats, which is usulally occupied by fishing boats. 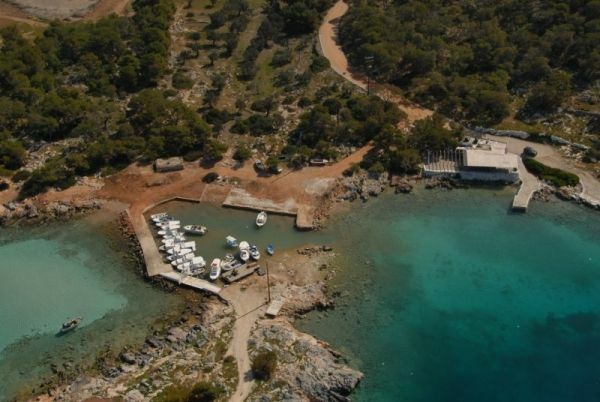 There is also a very small quay (for 1-2 boats) right in front of the taverna. We have seen motor boats up to 38 ft moored there, however you have to be very cautious because the waters are not very deep. 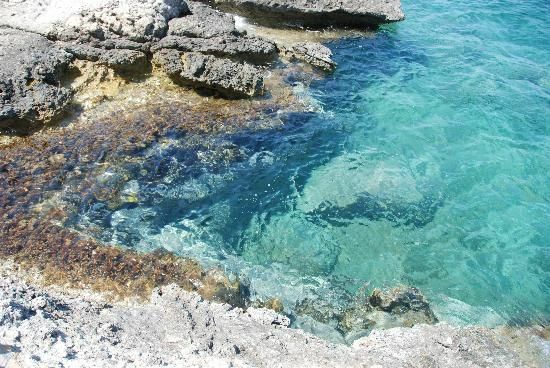 The northern cove (where the beautiful beach is found) is very small and has a signed area dedicated only to swimmers. Therefore, only a few smaller boats can anchor there. Larger boats may anchor further, but they will not be well protected. They may also anchor at the southern side of the little peninsula, which is protected by north winds but exposed to southeries. 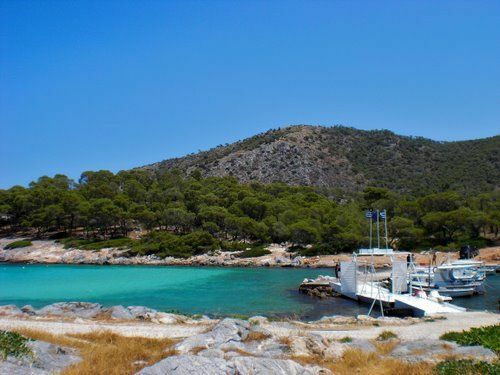 Depending on the weather, it may be better to anchor in Dorousa which also has a beautiful landscape and emerald waters.